D. Escalona-Vargas, R.B. Govindan, A. Furdea, P. Murphy, C. L. Lowery, and H. Eswaran. Characterizing the Propagation of Uterine Electrophysiological Signals Recorded with a Multi-Sensor Abdominal Array in Term Pregnancies. PLoS ONE, 10(10), 2015. This database contains uterine magnetomyographic (MMG) signals recorded using the 151 channel SARA (SQUID Array for Reproductive Assessment) system installed at UAMS, Little Rock, USA. Recordings are taken from 25 subjects who presented themselves in the Triage unit of Labor and Delivery and were undergoing monitoring and evaluation of labor. All subjects were asked to lean forward and sit comfortably with the sensor array covering their pregnant abdomens. The duration of a recording was typically around 20 minutes. To obtain the final MMG signals, the original 250Hz data was downsampled to 32 Hz, bandpass filtered (0.1-1 Hz) to attenuate the maternal and fetal cardiac signals, and notch filtered (0.25-0.35 Hz) to suppress the prominent maternal breathing around 0.33 Hz. Furthermore, segments with maternal movement were excluded. Each final recording in this database contains 147 to 148 channels and lasts between 10 and 20 minutes. Days to delivery after SARA recording. 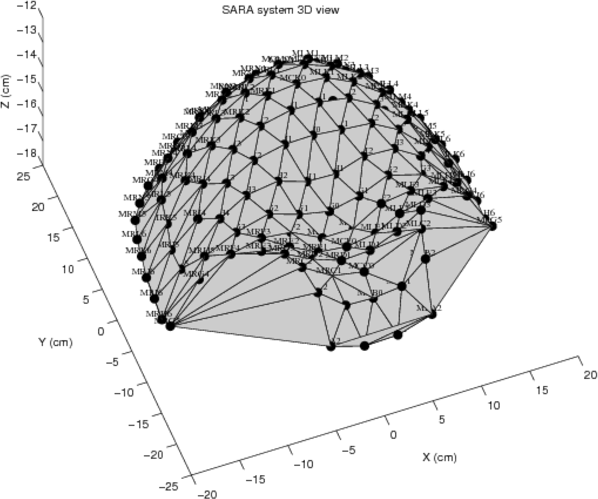 The sensorpositions record contains x, y, and z coordinates of the SARA array's 149 different channels present in the database. Refer to SARAarray.eps or SARAarray.tif for diagrams of the apparatus. H. Eswaran, H. Preissl, J. D. Wilson, P. Murphy, C. L. Lowery. Prediction of labor in term and preterm pregnancies using non-invasive magnetomyographic recordings of uterine contractions. Am J Obstet Gynecol, 190(6), pp. 1598-1602, 2004. H. Eswaran, H. Preissl, J. D. Wilson, P. Murphy, S. E. Robinson,C. L. Lowery. 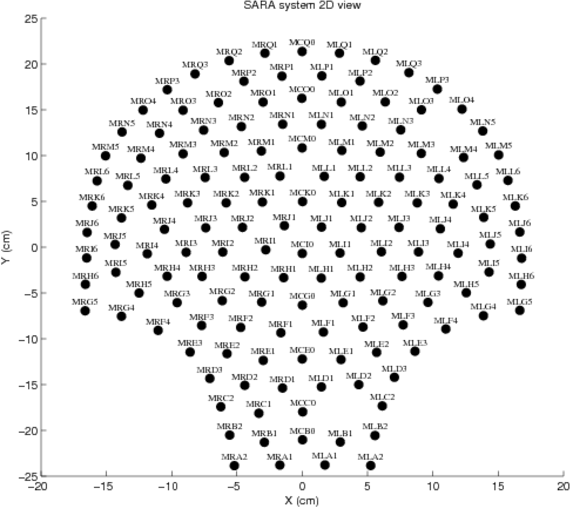 First magnetomyographic recordings of uterine activity with spatial-temporal information with a 151-channel sensor array. Am J Obstet Gynecol, 187(1), pp. 145-151, 2002.